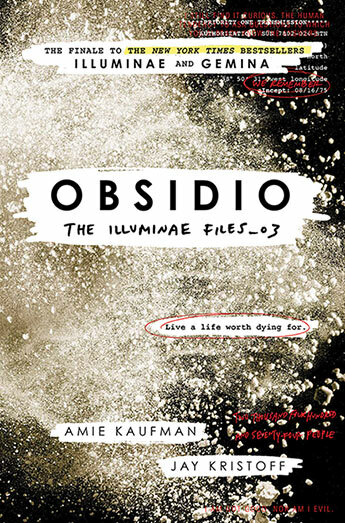 Amie Kaufman and Jay Kristoff bring their Illuminae trilogy to an action packed, emotionally charged, edge-of-your-seat conclusion in Obsidio. Of course these are, essentially, all of the ingredients that readers of this series have come to expect. As with the previous books in this series, Obsidio is told through a collection of found documents, graphics and text, and this style continues to work well to create a very visual, cinematic feel. In a nutshell – the survivors of the previous books have no choice but to retrace their steps to Kerenza IV. Meanwhile, on Kerenza, the Beitech invaders have become an occupying force, using the remaining population to mine the resources they need to repair their ships and leave. One of the occupying force is Rhys Lindstrom, ex-boyfriend of invasion survivor and insurgent Asha Grant, cousin of Kady, one of the heroes of Illuminae. Putting yet another, troubled romance at the centre of the action. But all of the surviving characters from previous books also have a part to play in Obsidio. This time, more than before, the young protagonists have to deal with a world where the adults just won’t take them seriously (but have to save the day anyway). Despite this broader focus, Kaufman and Kristoff effortlessly juggle the multiple plot threads and points of view, particularly in the final action scenes. There was plenty of death and destruction in the earlier books, but Obsidio is the darkest of the three. Readers expected the zombie hordes of Illuminae or the professional strike team of Gemina to be inhuman and it was easy to cheer at their demise. Obsidio, with its more military scifi feel, makes things a little greyer, exploring the dehumanisation of soldiers and the radicalisation of the oppressed population on Kerenza or the pressure cooker conditions on board the overcrowded Mao. And while the swearwords are still blanked out, the violence is often front and centre. Obsidio is guaranteed to appeal to its YA target audience and anyone else who likes a good, fast scifi read. It has almost constant action, plenty of bait and switch, and cliffhangers galore but it also has real stakes, is deeply felt and intensely humanistic. But most importantly, Obsidio delivers a satisfying conclusion to the Illuminae trilogy. This review first appeared in Aurealis #108, Australian Science Fiction and Fantasy Magazine, www.aurealis.com.au.